Do your calves and Achilles feel hot, tight or painful? 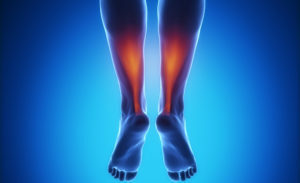 If you are you just getting back into sport or exercise, have flat (over pronated) feet, highly arched feet, tight calf muscles, walk or run on your tip toes, love wearing high heels, run or walk up acute hills or surfaces or wear bad footwear then you are that risk of Achilles tendonitis, and we can help! Achilles tendonitis is the injury or inflammation of the Achilles tendon also known as the calcaneal tendon. It is an overuse injury and is most commonly associated with joggers and jumpers, but can arise is anyone. Tendons are a tough type of muscle tissue that connects muscle to bone, which makes the Achilles tendon the tendon of the main calf muscle ‘Gastrocnemius’, and the secondary calf muscle ‘soleus’. Gastrocnemius & soleus originate at the posterior aspect of the lower leg & knee and attach via the Achilles tendon onto the heel bone (calcaneus). Achilles tendonitis maybe felt as a ‘burning’ sensation at the beginning of an activity, which lessens during an activity (after warm up) but worsen afterwards when resting. The Achilles tendon may feel swollen and stiff in the morning or at the beginning of an exercise. If your calves or Achilles tendon are swollen, red, or stiff and feel weak; then this is a sign for Achilles tendonitis. Also if you feel or hear a ‘crunchy’ sound when using the tendon, its a sign you need to get treatment straight away! Achilles tendonitis is preventable. If you are getting into exercise or beginning, start slowly and then gradually increase the duration and intensity of the training. Take time to warm up your calf muscles and tendon, and make sure you stretch and use spikey balls! If you feel pain at the start of an activity then stop. If you have time or have access to a gym, strengthen your calves, the stronger your calves are the better they can handle the stresses they encounter from exercise and activities. We recommend you to book in as massage is highly beneficial for this condition as we can use our high range of skills such as; trigger point therapy, myofascial cupping, needling, and many more techniques. These techniques all help make the calf muscle loosen and not so tight, making the Achilles tendon not have so much stress and pressure on them. We also can apply RockTape which will help increase mobility and increase the healing stages. We also give self-care advice, which you can take home with you to help yourself treat this condition. So if this is you or think you are at risk, book in today! It needs to be treated ASAP! Achilles tendonitis can lead to bone spurs or even further tearing or rupture of the Achilles tendon.